Each area, or ward, of Leeds has three councillors. Local councillors represent you in decisions made by the council, are available to help with any local issues affecting you, and have money to spend on improving the local community. The Calverley and Farsley ward, which covers Calverley and Farsley as well as parts of Pudsey, Rodley, Stanningley, Thornbury and Woodhall currently has three Conservative councillors, all from one corner of the ward. At the next election on 3rd May you have a chance to change this. As your Labour councillors we would better represent you as a more diverse set of candidates, with varying life experiences that mirror those of residents from across the ward and provide vital real-world experience on the wider council. 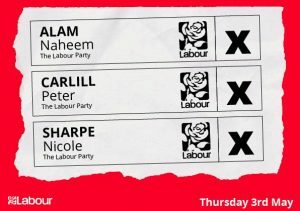 About your candidates, Peter Carlill, Nicole Sharpe and Naheem Alam. If you elect us, we will focus on reaching out to more areas of the ward with a wider range of improvements and community activities, run weekly surgeries spanning all corners of the ward, and regular street surgeries to look for and help solve issues in the area. We will, of course, always be available to meet to discuss issues at a time that suits you or be available to discuss issues over the phone. We were so disappointed to hear that Calverley Parkside Primary has received an academy order from the Government’s Regional Schools Commissioner, forcing it to become an academy. We will fight this every step of the way and want to work within the Labour Group on the council to ensure as much as possible is done to support local schools so they don’t face the same fate. Leeds Labour Council’s transport plans for our area are ambitious, with plans to double bus journeys and improve journey times, improve major junctions like Dawson’s corner, and to increase the capacity of New Pudsey train station. We’re pleased money is being spent improving transport in our area, but we want to represent you in the labour group on the council to ensure these decisions are taken with the needs of the local residents first. Leeds Labour council has a proud record on health and social care, being recently awarded the best city for health and wellbeing and a further increase in budget for health and children’s services across the City is planned for the coming year. Keeping children’s services as a priority area, the Labour Council are proud to have managed to keep all children’s centres across the city open in spite of severe cuts. Thanks to funding provided by the Labour Police and Crime Commissioner and the Labour Council, Leeds has been able to protect Police Community Support Officer numbers across the City, and recruit over 140 new police officers and staff across West Yorkshire. We will always work within the council to protect policing numbers in our community. Young people in our area are often vilified for hanging around on street corners, purely because there is nothing else to do. We would work to ensure there are activities and clubs for young people in our area, as well as working more widely across the city to ensure there are opportunities in education, apprenticeships, jobs and housing to give young people hope for a future in our society. “As a Careers Advisor for many years I have seen how tough it is for young people, with the opportunities and support available to them diminishing considerably over time – in particular over the last few years due to the severe Tory cuts”. Although we increased our support in the general election last year, we weren’t quite able to elect a Labour government. But we came so close. In our area we were just 331 votes away from electing a Labour MP for Pudsey. In the absence of a Labour Government the council is the last hope to reduce the effects of austerity in our local area. We would work with the Labour council to enact as much of the Labour manifesto as we could at a local level, to build a community that works for the many not the few. Although this is more difficult under the government’s cuts, there is still a lot we can do to affect how local services work in Leeds, and we would continue to work hard to elect a Labour government to complete the job.